Many online marketing pro’s (including me) preach about how social is important, but for the smaller local business who don’t have the resources or the knowledge, this is a very real question, especially when there are many articles floating around suggesting that if you get an intern to do your social, you may be committing brand suicide. 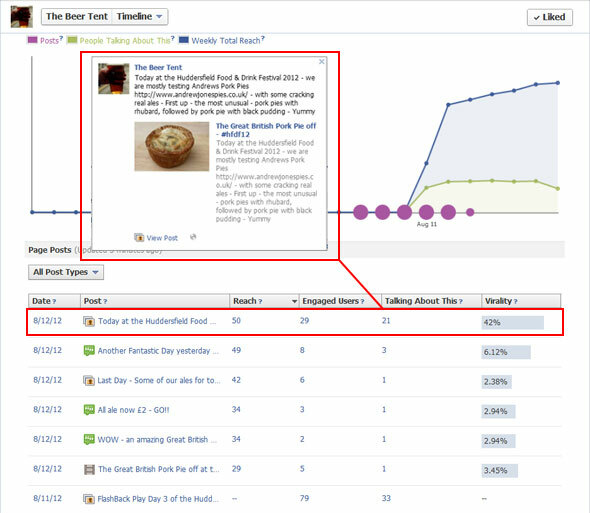 Small local businesses want hard facts and figures as to how much money social might make and how long it will take to see results, so I thought I’d do an experiment on a local level to see just how much reach there might be with a ‘bit of social‘ and publish the results. Hopefully you will see that we got more than great content, we made some fantastic local connections and became part of the festival itself. You may also think differently about short term Social Media for events as just the starting point as opposed to the beginning and the end. If nothing else, I hope this post can show you how simple ideas can be put together and that thinking of what to tweet is not as hard as it seems when you are surrounded by shareable content! 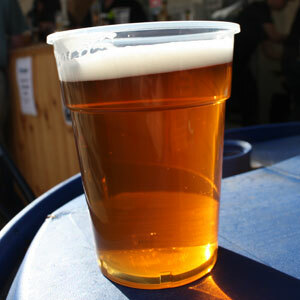 For the past few years, I have been helping out a friend with a real ale tent at the Huddersfield Food & Drink Festival. Last year, I put ‘the Beer Tent‘ on Foursquare for fun and promptly became the Mayor – noting to self that the festival had potential for local businesses to make a lot more of social media. This year in order to illustrate the point for a local ‘lunch & learn’ session I thought I would use the festival to get some real data to see what could be achieved and how much work it would take for a tent that comes out once a year for 3-4 days – with the assumption that results for a local bricks-and-mortar business could be multiplied considerably and built up further after the event. About 6 hours of my time over the entire weekend was used to make content with most of that time spent uploading to YouTube and Twitter. This blog post has actually taken more time to write and prepare images for than the work involved over the weekend! The event started on Thursday 9th August and ended on Sunday 12th. All media channels were literally set up the night before. Content was created using a camera with video capability that can fit in a pocket. Given that DSLR’s are not too partial to real ale spillage, I kept the 450D well away so I chose my trusty conference partner the Canon Powershot S100 compact. Our internet connection was based in the real ale tent using a wireless hub/dongle that just happened to have been brought along – otherwise we would have used the tether function on my HTC Desire mobile phone. There was no time to test any other tools, so went with the quickest options at the time and what was on the laptop! To see if we could catch any festival fever or any ‘night before’ tweeters, we wandered around the site in the sunshine taking photos. Next step was to find out the hashtag for the event which most organisers think about, but surprisingly many forget to publish the hashtag on event materials. 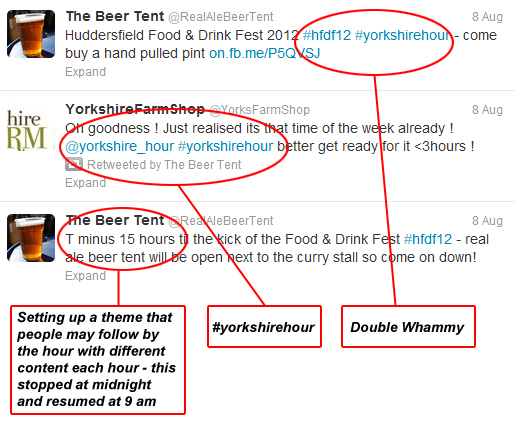 The Hudds Food & Drink Festival tag was #hfdf12 so an autotweet feed was set up in TweetAdder with the nights content and a ‘T minus X hours’ theme. All photos were uploaded to the Facebook page so that we could tweet to an actual URL as opposed to a picture kept within the Twitter environment. We changed this later as we were missing a few tricks but more on that further in the post. Whilst tweeting and by sheer coincidence #yorkshirehour appeared in Twitter on Wednesday night so I also used that hashtag to see if we could get some followers or real ale buyers to show interest. If you have no idea what #yorkshirehour is – it is one of many local hashtag trends. I was first introduced to this phenomenon by Geoff Kennedy at Yard Digital in Edinburgh, who showed me #scotlandhour. Find out your local hashtag and have a go – it’s crazy fast but fun and who knows, you may even get some business and new local friends! First job was to print out ‘check in on Foursquare‘. 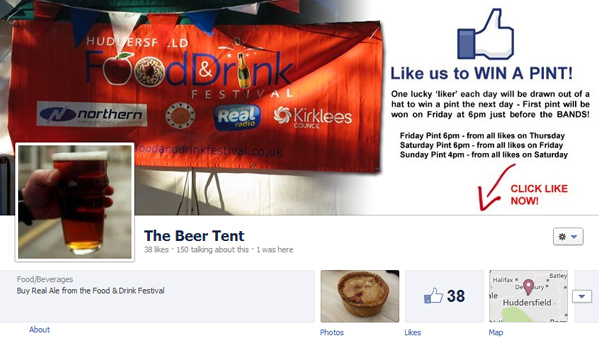 and ‘Like us on Facebook‘ posters to pin to the beer tent. Then wander about taking photos of the most interesting things/scouting for content over lunch that might get shared by other festival goers and vendors. 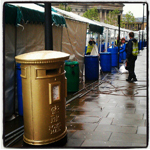 We tried to make some online local friends using the photos from the night before, #huddersfield hashtags, and newsworthy events such as local hero Ed Clancy winning Huddersfield a Double Golden Post Box. As an afterthought a Facebook Cover was added and more posters to say ‘Like us on Facebook for your chance to win a pint‘ to see if it made any difference to our popularity over the weekend. Seeing as we were selling real ale, we chose pictures of all the other beer tents to show the wealth of ales available and to spread some social love to other festival business. Combine this with pictures of beer and tasting notes in the real ale tent, we were hoping to catch the imagination of lunchtime festival goers and see if we could get the breweries to tweet out to their own followers. On the Friday night, local band Storm played – perfect photo content for a potential ‘spot yourself in the crowd‘ competition. 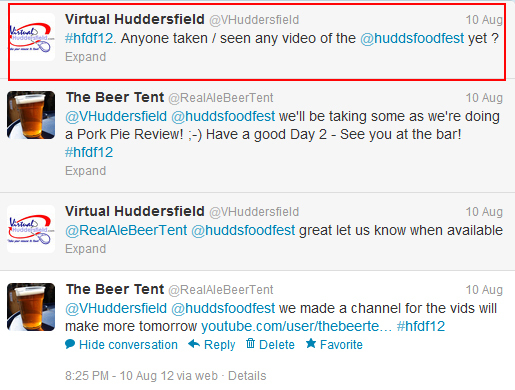 Then we saw the tweet below of Virtual Huddersfield requesting video content. Realising there was a gap in the social market – The Beer Tent video channel was born. This may not have happened at all as like many business, I thought creating video content may be just a little too much to take on but it has proved to be the most viewed content. Traditionally the busiest day so we got prepared early spending about 2 hours uploading content, creating tweets for our feed on Saturday morning and put them into Tweet Adder to spin them out in different ways in order to appear that we were making as it happens videos, pictures, and regularly changing barrels of ale. Anyone watching the feed would have noticed but we did this on purpose to see if we received any complaints and to see how far we could push it – turns out, if you are providing things that people want to see and share – no one minds. If anything we received requests for content! By this time we had made friends ‘in person’ with the organisers, and were actually doing this not only to sell real ale, but to provide great content for a fabulous local event due to being locals ourselves. We received feedback from the organisers that this was making a real difference and encouraging others to also post content on the Festival Facebook wall. The last day. Another chance for content, but more importantly, our last chance to sell the beer. We were not a pub so could not take stock back to the ranch. Realising that no amount of tweeting last orders was going to make much difference to people that had already visited the festival or were already there, we decided to make the Sunday about memories and thanking those that gave us free food by way of content that they could share and that would be shared (thank you Ali Murad and Andrews Jones Pies). The ‘Pork Pie Off’ clips were the most viral on and offline 42% virality on FB but also drawing people to the beer tent to come over to see if they could get free pork pie! 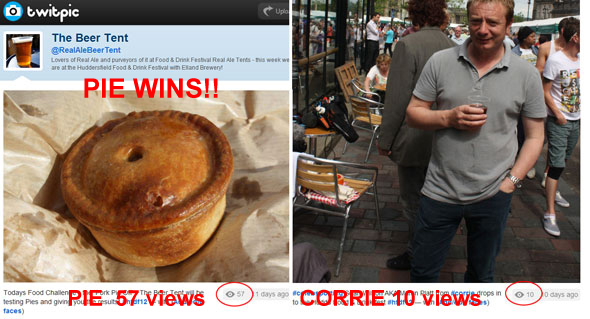 The Pork Pie off also made the most viewed pictures on Twitter (55), and has had the most RT’s. This was literally point>click>upload content with no editing. 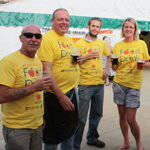 After talking to the Hudds Food Fest team, they said that the interactive PDF of the event had been downloaded/shared 42,000 times. Although this figure may be visitors looking several times or overall reach – these are not small numbers for a local event (now the biggest of it’s kind I am told). They also said that they had never seen so much social activity in the 12 years they had been running the event. In 48 hours, we managed to get the bulk of our 667 Followers on Twitter and 684 video views, – that is not that many less than I have on my own Twitter account now after several years of passively sharing content. We only managed to get 38 FB likes, some of whom I encouraged to join to get the ball rolling so Twitter and YouTube were definitely the winners. Unsurprisingly, photos that were shared on the event FB wall were the most ‘viral’ according to Facebook stats – with the winner being the ‘Pork Pie Off’ at 42% virality. 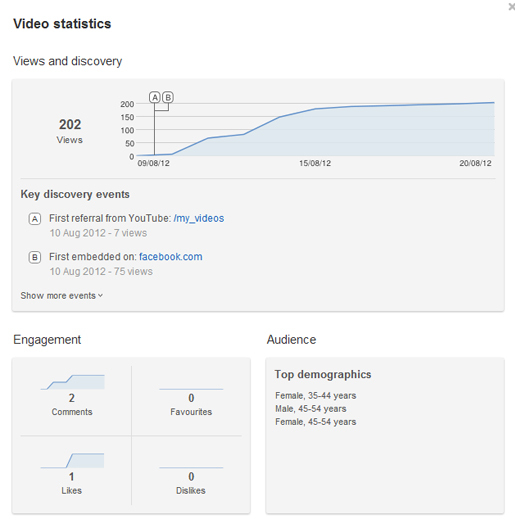 There have been more likes and views this week than there were over the festival dates. Remember what I said earlier about missing a trick on Twitter? 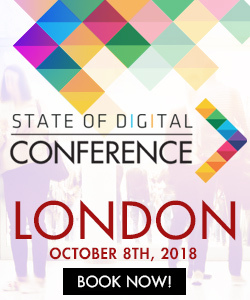 Turns out that if you don’t upload pics directly using YFrog and TwitPic – your content may be overlooked with packages such as Storify.com – showing the best tweets, videos and photos from the event. Knock us off the Mayorship and we buy you a pint competition – this backfired as the beer tent helpers all logged in so the public had no chance! Using content we thought would be shared more such as pictures of Food (always a winner), pictures of lovely beer in the sunshine, our genius plan of a ‘Pork Pie Off’ which also got us a selection of free pies! Using all the techniques in last years post: Killer Search Operator Tactics for the Social Marketer – we found out who was local, who liked real ale, who was on Twitter and put their ID’s into the ‘follow followers of’ function in TweetAdder – Simples! This built our followers practically overnight. OK so we followed a lot of people and sometimes that can look spammy, but the function to unfollow when people don’t follow us back will take care of that! We managed to get quite a lot of followers so it doesn’t look as bad as it could have. The fact that we sold out of the whole weekends ale on the Friday night and had to re-stock gives you an idea of the success of the event. However, given the tight timeline, we cannot guarantee that the social elements directly sold beer, but they did give the tent a lot of interest, got people coming back, and gave us a talking point to customers and organisers alike. 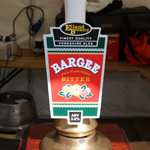 We know that some people saw the tweets and came to check us out due to the photographs of the food and ale as they told us when they got to the tent, and even now we have followers and fans asking us about the raspberry cider so it is only a matter of time before we are asked when the next one is! The event is over – what now? We left it for a week, then yesterday for the purposes of this post, we auto-tweeted out to see if anyone came back to the content. The answer was yes! Some followers think the festival is still on, people are commenting on the pork pie pictures but most people have been genuinely interested in the content. We we are now considering doing more local food & drink festivals next year so what was an experiment could turn into a great business. Looking at the video stats from the most shared video, the amount of views has only just started, so if we kept up the momentum who knows what could be achieved as a local channel with regular foodie content. If you are a local business with produce to sell, you can’t go far wrong than gathering data on the day and encouraging repeat business long after the event has finished. I know not every day is an event such as this, but if you treat your audience to your business personality on a daily basis, there is no reason why you cannot grow your local following in the same way. This does not just work with food, the local plumber, car hire, garage. Everything you know can be turned into a tip, a tweet, a photo, a how to video or shareable content so if you get into the habit of snapping as you do pictures of personal events, you will always have great content to hand. Imagine if you were a budding local film maker, or local photographer or just wanted to have a go at making content to practice for your own local social presence, with support like this and the potential for visibility on that scale, you can’t go far wrong than dipping your toe in the water (or supporting your local events!). Take videos – highly shareable and more likely to hit Google with a bit of Video SEO Love and Closed Captioning. The Public = content for free so long as they turn up! Right – after that epic post – I fancy a pint – anyone? Great post Jackie !! 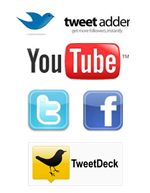 Very interesting to see how many Twitter Followers and Facebook fans you got in just a few days. Great post Jackie. Star as always. Really interesting stats and a good case study for local event organisers on how social media can play a part in spreading the word of mouth. Hey Thanks Ils! It was a fun weekend for sure! Jackie, a cracking read with some great points, but the most salient one is missing: if someone had wanted to hire you to do all that you did, putting in the hours that you did, what would that have cost? Yes, you make the point that any firm can do this if they adjust their thinking a little but many of them don’t have the time to. Sadly, even less have the budget, so this is a cracking example of how to do it but it may well be that not everyone can afford either the time or the budget to do it – and to me that’s the big shame. Hi Craig – thanks! I just got your tweet saying you were being a spoilsport! Not at all – it is a very good point. So I hear you on the no time or budget issue although for many it is a case of forming a habit once they have committed to ‘a bit of social’. However, the chicken and egg is that how do you turn it from a chore you don’t have time for into something that matters? The stats from the Festival organisers and the fact that they had more social engagement at the event on Twitter than ever before (I couldn’t get a quote in time), shows that the potential customers have had an adjustment in thinking so local businesses ‘may’ need to think about that. It doesn’t have to cost the earth as there are free or inexpensive courses all over these days. I sometimes do free lunchtime sessions every now and again to help teach local business for example. If everyone in the company makes a tweet a day, before you know it, you have you have a channel with a lot less effort than you think (I have tried this approach with a company in the USA and now they all want to have a go!) 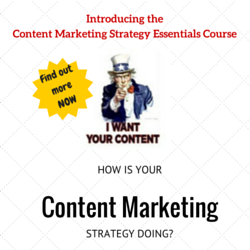 – BUT as with blog posts, having someone help you establish your editorial calendar is a good idea. Thanks for taking the time out to share this. I especially like the “T minus” event idea, thats just plain cool. Thanks David – I must admit I set up two then thought – oh no – this may take a while – but it definitely made it easier to post the same content without being tuned out as much! Jackie, you need to lead a social campaign for them to have the festival more than once a year – it was a great event! ! Hi Jackie. This made a real difference to our festival – especially having the photo’s that you took available on fb – they were posted during the day, so anyone on social could go and view and get some idea of the event and what they were missing out on! Thanks for everything – we hope you are around again for the next one!